Doogee, last month, released a teaser video of its bezel-less Android clone of the Apple iPhone X called Doogee V. Today, the landing page of the Doogee V has gone live and it revealed all the key specifications of the smartphone. Like it teased earlier, the Doogee V will come with an under display fingerprint scanner same as the Vivo X20 Plus UD. 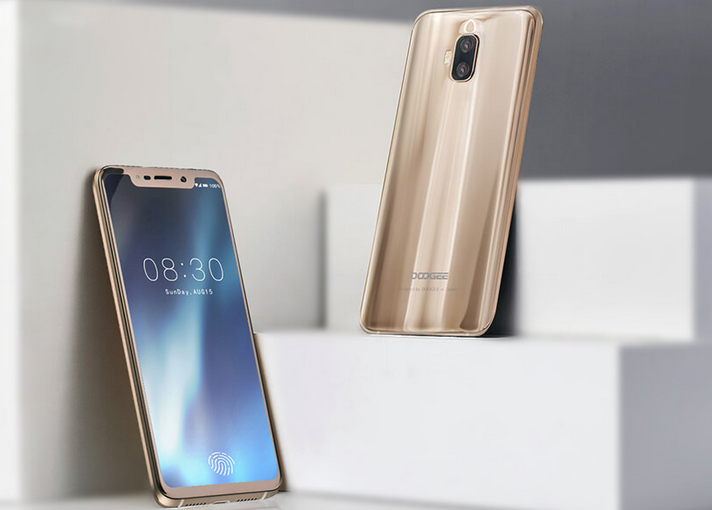 Alongside the fingerprint scanner, the Doogee V also comes with Face ID feature to unlock the smartphone, 6.21-inch AMOLED Full HD+ display, and some dedicated Artificial Intelligence features, which are yet to be revealed by the company. As you can see in the images, the front of the Doogee V is largely dominated by the Full HD+ AMOLED screen, which is of 6.21-incher in size. There’s a small Chin, unlike the iPhone X which doesn’t have any bezels on the front. To the back of the phone, we get the dual camera setup, and thankfully, they didn’t copy the iPhone X design. There’s a notch on the front of the phone, which will house the selfie camera and other sensors. Thanks to the use of glass back, the smartphone will have wireless charging support as well. The processor used on the Doogee V is unknown at the moment, but most probably, it will be a MediaTek chipset. Also, MediaTek is expected to announce the Helio P70 SoC at the event, and the Doogee V could be the first phone running it. Then there’s that Face ID feature listed on the company’s website, which of course, might be a software-based one and not hardware based one like the iPhone X. The phone will have NFC support and might run Android Oreo out of the box. It will have a 4000mAh battery inside along with some Artificial Intelligence features, which are not known yet. Lastly, the Doogee V will come with dual cameras at the back. A primary 16MP camera will accompany a secondary 8MP sensor, which could capture depth information. Doogee also confirmed that it would be announcing the Doogee V on February 27 at the MWC 2018 event. Alongside Doogee, Asus will also be launching an Android smartphone with that infamous notch above the display.